Ouça suas músicas favoritas sem precisar de fios, de até 90m de distância. Esse transmissor RF e o headphone sem fio recarregável reproduzem um som rico a partir de quase qualquer fonte e oferecem auto on/off. O fone de ouvido sem fio RS 120 II não apenas abre um novo mundo em movimento mas também traz vida a seu áudio com sua qualidade e design. Sua reprodução sonora detalhada e balanceada e forte resposta de graves tornam-no a escolha ideal para todos os tipos de música e aplicações de TV. Redescubra o mundo da liberdade sem fio com um toque de simplicidade e elegância. Compacto, instalação e carregamento muito fácil e som sensacional. Melhor fone para televisão que conheço. Confortável e fácil de configurar. Preço um pouco salgado e deveria poder usar outro tipo de fone de ouvido no mesmo transmissor, por exemplo o meu é o 120 e poderia usar o 110 como extra ou mesmo de outra marca que tivesse a mesma frequencia. Can I use multiple RS 120 transmitters in a single location? The RS 120 Wireless Headphone System has a transmit range of approximately 300 feet and there are three (3) channels (frequencies) that the transmitter can transmit on. It is possible to use up to three (3) transmitters in proximity of each other and this can be done without the transmitters interfering with each so long as each transmitter is set to a different channel (frequency). On the front of the transmitter near towards the bottom is a small white switch which is the CHANNEL switch. This switch has three (3) positions (left, center, right) and each position corresponds to a different frequency. When setting up multiple transmitters make sure the CHANNEL switch is set accordingly on each transmitter. For example on the first transmitter set the channel switch to a position (ie: to the left) and on the next transmitter set the switch to a different position (ie: in the center or to the right). Once the transmitters are set accordingly you then use the TUNE dial on the headphones to tune into the appropriate audio signal you want to hear. How do I add additional headphones to a RS 120 wireless headphone system? The RS 120 Wireless Headphones system is made up of two main components - the transmitter (TR 120) and the headphones (HDR 120). Headphones can be purchased individually but transmitters are not available individually. To expand a system to have multiple headphones there are couple of options when adding extra headphones to the system. 1) Purchase an additional set of headphones (HDR 120) and tune the headphones into the existing transmitter. NOTE: The transmitter can only charge one headset at a time so the headphones would need to be placed on the base in turn to charge. 2) Purchase a second complete system (RS 120) and tune the headphones into the existing transmitter and then use the second transmitter only as a charging station. 3) Purchase a second complete system (RS 120) and have both transmitter set up and transmitting on separate channels. NOTE: This option would generally only be used when different audio sources are in use and then it is a matter of tuning the headphones to the appropriate base station to pick up the audio signal that is desired. The channel switch is a small white switch on the front of the base station near to bottom. 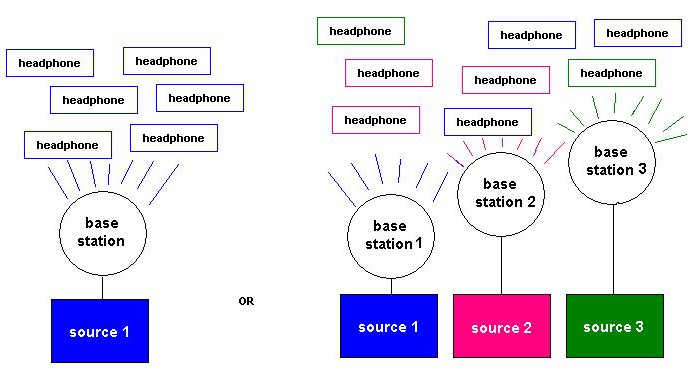 Here is a diagram showing the scenario with one transmitter (base station) transmitting to multiple headphones and the scenario with three different transmitters (base stations) connected to different audio sources transmitting to different headphones. NOTE: In the second scenario to change a headphone from receiving the signal from base station 1 to receiving the signal from base station 3 it is simply a matter of adjusting the TUNE dial on the headphones until the signal from the desired base station is picked up. NOTE: Since the RS 120 is a radio frequency (RF) system the number of headphones that can be added is unlimited and the only requirement is that the headphones are in range of and tuned into the transmitter. How do I change the batteries of my RS 120 headphones? When replacing the batteries of the RS 120 wireless headphones you should use rechargeable AAA 600-900 mAh NiMH batteries. In order to insert the batteries into the headphones the ear cushions must be removed from the headphones. NOTE: Inside the headphones the batteries face the same direction. 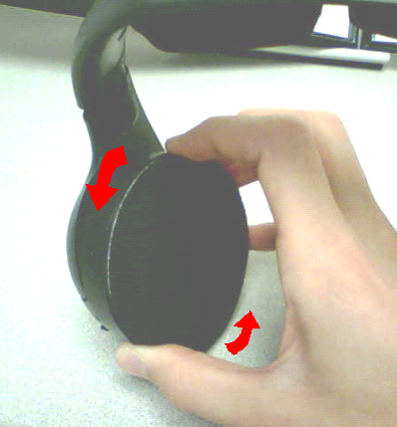 How do I change the ear pads of the RS 120 headphones? To remove your ear cushions simply grip the rim of the cushion and rotate it counter clockwise. The RS 120 can be connected via a 3.5 mm plug into a dedicated headphone jack (which will often cut sound to the external speakers) OR to the RED & WHITE RCA audio output jacks (often found on the back of the TV, cable box, receiver, DVR, etc) and when connected in this manner they will allow for operation of both the headphones and the external speakers. To connect the headphones you will need to plug the transmitter into a power source and the audio cables into an audio source. When you connect the transmitter/charging station to the power outlet and place the headphones on the cradle the RED light will come on to indicate charging. When you plug the audio cables into an audio source (via either the RED & WHITE RCA audio output jacks or a dedicated headphone jack) that is turned on a GREEN light will appear on the transmitter. The aim when connecting the audio cables is to get a GREEN light on the transmitter because it indicates that an audio signal has been located by the transmitter. Once you have the GREEN light on the transmitter then it is simply a matter of tuning the headphones into the transmitter. NOTE: The GREEN light indicates that there is both a power source and an audio source present and NOT only a power source and sometimes the two are confused. On many audio sources the audio output connections are located on that back of the audio device and this is where the cables from the transmitter should plug in. Typically a headphone jack is designated by a headphone icon and analog audio RCA connections will usually be RED & WHITE. Sometimes the colors of the cables coordinate with the colors on the audio connections and sometimes they don't so a bit of experimentation may be required. Remember the aim is to get the GREEN light on the transmitter to come on and stay on. Once the transmitter is connected to the TV and the GREEN light is showing on the transmitter then getting sound should not be an issue as it is simply a matter of using the tuning dial on the headphones to locate the signal being sent out by the transmitter. If the GREEN light doesn't come on or COMES ON AND AFTER A FEW MINUTES GOES AWAY when the transmitter is plugged into both a power source and an audio source then it means that the audio signal is is too low (or not getting to the transmitter at all). The transmitter needs a nice, loud signal to work with or the internal electronics will shut off within 5 minutes if no/very little volume is detected to conserve battery life. If this is the case then the signal level needs to be increased before reaching the transmitter. This can be accomplished by turning up your source on variable-level outputs (ie: TV Volume) or by increasing the signal from a fixed-level output (increasing the output level to the audio output jacks which is done through the TV set up options). Try increasing it in small increments to prevent overload which results in distortion. Also check to see that you are connected to outputs and not inputs. If you are still not successful in getting the GREEN light to appear on the transmitter or you are unable to adjust the audio settings on the TV you may also try to connect to a set top box (cable box, DVR, HD receiver, etc) through its audio outputs or connect through a headphone plug. NOTE: If there is no analog audio output available on your audio source and the only option for connecting the headphones is a digital audio output then a digital to analog decoder would be needed to connect to the digital output to change the digital signal to an analog signal for the headphones to use. Should the charging light of the RS 120 always remain on? On the front of the transmitter there is the battery charging indicator light and when the battery is charging this indicator will light up RED. Any time the battery is charging (ie: the headphones are on the charging cradle) this light will be lit RED and it will NOT turn off until the headphones are removed from the charger. 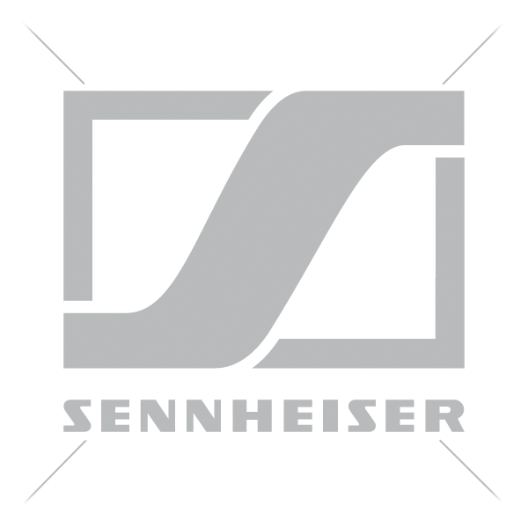 NOTE: The batteries cannot be overcharged because Sennheiser utilizes "trickle charge" technology so that once a battery is charged the charging switches to a lower level to maintain the battery's full charge. What do I do if my RS 120 unit suddenly stopped working? In a situation where a unit that has been functioning correctly has suddenly stopped for no apparent reason the issue is likely an internal electronics glitch caused by a power surge. To resolve this issue an internal electronics reset is required. NOTE: If the batteries need changing it is best to use AAA size 600-900 miliamp NiMH batteries. After the reset period reconnect the system to power and put the batteries back in the headset. The aim when connecting the audio cables is to get a GREEN light on the transmitter because it indicates that an audio source has been located by the transmitter. Once you have the GREEN light on the transmitter then it is simply a matter of using the TUNE dial on the headphones to tune the headphones into the transmitter. If the GREEN light doesn't come on or comes on and then goes away when the transmitter is plugged into both a power source and an audio source then it means that the audio signal is is too low (or not getting to the transmitter at all). The transmitter needs a nice, strong signal to work with and if the audio signal is very weak (or non-existent) the internal electronics will shut off within 5 minutes to conserve battery life. If this is the case then the signal level needs to be increased before reaching the transmitter. This can be accomplished by turning up your source on variable-level outputs (TV Volume) or by increasing the signal from a fixed-level output (increasing the output level to the audio output jacks which is done through the TV set up options). Try increasing it in small increments to prevent overload which results in distortion. Also check to see that you are connected to outputs and not inputs. If there is no way to increase the audio signal and hence the GREEN light does not come on and stay on on the transmitter it would be recommended to try to connect to a set top box (cable box, DVR, HD receiver, etc) through its audio outputs or connect through a headphone plug in order to get a stronger signal. What is the difference between RS 120 and TR 120 and HDR 120? The RS 120 is the model number refers to the complete wireless headphone system. This system consists of the transmitter (TR 120) and headphones (HDR 120). What should I do if I get static in the RS 120 headphones? These headphones need to be connected into the RED and WHITE RCA audio outputs or the 3.5 mm headphone jack. Double check your connections as sometimes devices will have extra RCA connections near the ones you need and if you connect into the incorrect one that can cause sound issues. If you are connecting into the 3.5 mm headphone plug please ensure it is a dedicated headphone plug and not a digital audio out as a digital audio out is not directly compatible with these headphones. When you connect to an audio source that is turned on the GREEN light will appear on the front of the transmitter. This GREEN light indicates that there is an audio signal and then it is simply a matter of using the TUNE dial on the headset to tune into your audio signal. NOTE: If the GREEN light turns off that indicates that there is no audio signal or the audio signal is too weak for the headphones to use and the transmitter has turned off and this will result in static. It is imperative that the GREEN light is on. If you are getting static in the headphones and using the TUNE dial does not resolve the issue then you should change the channel on the transmitter (small white switch near the base of the unit) and then re-tune the headphones. If none of the three (3) channels on the transmitter results in a clear signal then you will want to try connecting to a different audio source to determine if it is the headphones or the audio source that is the issue. If you connect to a new audio source and the static is gone then that indicates that the original audio source is the issue. What should I do if the batteries in my RS 120 are not charging? On the front of the transmitter there is the battery charging indicator light and when the battery is charging this indicator will light up RED. NOTE: Any time the battery is charging this light will be lit RED and it will NOT turn off until the headphones are removed from the charger. The batteries cannot be overcharged. In a situation where the battery does not appear to be charging there are a few things to check. Firstly make sure that the batteries in the headphones are rechargeable 600-900 mAh NiMH batteries as standard alkaline batteries will NOT charge. Secondly make sure that the batteries are correctly aligned and securely in place. Occasionally the batteries wiggle loose and causes the non-charging issue. Thirdly ensure that the power supply is connected into the transmitter and into a functioning electrical supply. NOTE: Sometimes when the power cable is connected into a power strip the power strip is not functioning correctly or not providing enough power for charging so it is advised to connect directly into a wall outlet. In order for the battery to charge a good connection needs to be made between the contact points on the headphones and the charging cradle. To ensure that a good charging connection is made make sure that the ear cups are not extended as extended ear cups can cause the headphones to not alight correctly and hence not charge. On occasion when the headphones are brand new and the headband cushions are stiff or the headphones are older and the cushions have started to spread out the cushions can be preventing the headphones from making contact with the charging cradle. In a situation like this applying some downward pressure to the headphones when they are on the cradle can ensure the contact is made. If none of the above solutions work then it is recommend that you try an internal electronics reset by disconnecting the system from both the audio source and the power source and leaving the system disconnected for 15 minutes. This gives the unit a chance to reset back to factory settings. At the same time you should check the batteries and change them if necessary. When changing batteries you want to use 600-900 miliamp NiMH AAA batteries. After the reset period you should reconnect the system and test. Why do I hear an "echo" in the RS 120 headphones? The RS 120 headphones are "open aire" headphones which means that they allow sound in and out of the headphones. The headphones are designed like this to provide a more expansive sound scape and more nuance to the audio. The "echo" that is sometimes experienced is caused because the same sound (ie the sound through the headphones and the other speakers) is being heard twice at slightly different times. 1) Turn the volume in the headphones up until it covers the sound from the other speaker and eliminates the echo. 2) Turn the sound from the other speakers down until it gets low enough that the volume through the headphones is stronger than the sound from the other speakers and hence the headphones hide the echo. NOTE: Sometimes a combination of option one and option two are needed to achieve the desired results. Video tutorial on the setup of the RS 120 series of wireless headphones.